Who is Dr Bhatti ? This is the homepage of the Bhatti Eye Clinic, based in Mumbai (formerly Bombay), India. This site promises to develop into a great ophthalmology site for eye patients with problems as well as ophthalmology students, so keep visiting it regularly. As with almost all of Dr S S Bhatti's projects, this site is permanently under construction. The Bhatti Eye Clinic at Mumbai, in India, is reknowned for its best of breed specialist eye care and eye surgery outcomes especially for cataract surgery and laser eye surgery. 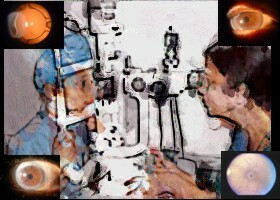 Besides cataract surgery by phakoemulsification (phaco surgery) and lasik with excimer laser, exceptional treatment results are also delivered in glaucoma surgery, corneal transplants and oculoplastic surgery, as well as specialist laser procedures for the retina, laser procedures for the anterior segment, and laser preocedures for the lacrimal sac. treatment of eye diseases and eye care, phaco surgery, eye clinic.